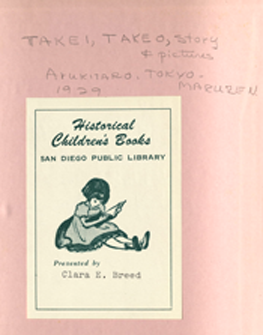 Takeo Takei's Aruki Taro (1929) is a rare volume made rarer still by a bookplate that reads "Historical Children's Books, San Diego Public Library, Presented by Clara E. Breed." and Breed's own hand “Takeo, Takei. Aruki Taro. Picture Stories. 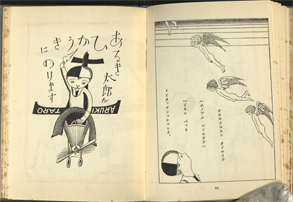 1929, Maruzen.” Irreplaceable, this volume connects two bright lights in the history of books for children, Takeo Takei and Miss Clara Breed. TakeoTakei(1894-1983) was a Japanese author, artist and book designer, and a founding member of Nihon Doga Kyokai/Japanese Association of Illustration for Children. 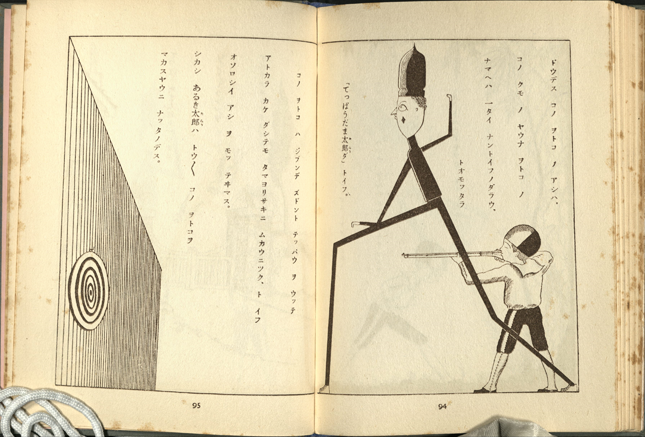 In the 1920s, Takei created Douga (his word), or children's pictures for.children's magazines and books thus strengthening the children's illustration movement in Japan. He is also known by Manga historians for his 139 Kampon art books he created between 1935 and 1983 using ever-changing media forms to stay new. Clara Estelle Breed (1906-1994) holds a place among those heroines of the international children’s library movement who ensured the right to read for children vulnerable to the effects of war. Later to become San Diego Public Library director, as children's department head and librarian, Breed corresponded with Japanese-American children in U.S. concentration camps after the attack on Pearl Harbor and she provided books for kids in camps. Her story is told in Dear Miss Breed....Letters from Camp, a book, documentary, and permanent exhibit at the Japanese American National Museum. Breed’s legacy is one of protecting civil rights of young readers and Takei Takeo's Aruiki Taro Japanese picture book in Breed's collection shows her respect for Japanese children's literature. Here is the story of Ikutaro who embarks on a mysterious journey by train, ship, car and airplane and what he finds at the end of his journey. Takei's imagination takes readers into his "Douga" or children's picture world that touches hearts of children with "i-ru-fu" new, passionate, and fresh ideas, the reverse of fu-ru-i, or old. 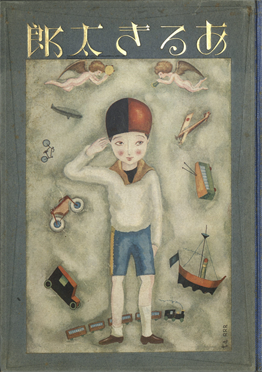 A light blue volume, on the cover is a pastel illustration of a little boy in red shorts and a black and white hat saluting as colorful angels and toys float around him on a smoky pearl white pastel background. Japanese title lettering is in gold. 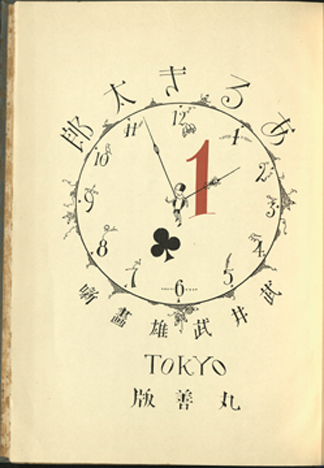 Opening this Japanese book from left to right light pink endpapers encase a tissue cover over the title page that is an image of a clock in black ink except for a crimson numeral 1. Numbers on the inside of the clock are in Arabic numerals but numbers on the outside of the clock are characters. Inside the clock is the black ink clover a signature symbol for Maruzen bookshop/publisher. Characters are fantastical with very long legs and skinny almost stick arms making them appear themselves as toys. RRR is the author’s usual signature in his books and it appears throughout this book on various pages. This cosmopolitan book includes many languages and characters Japanese, English, French at least. 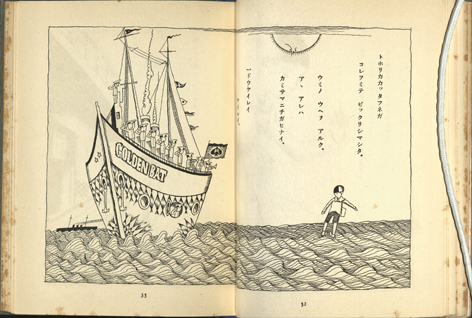 Takeo uses many elements also found in Victorian England children's picture books including references to science, technology, nature, progress, spiritualism, Lewis Carroll-like playing card characters, fantasy and nonsense in depictions of magnets, bicycles, garden scenes, space travel and fairies. 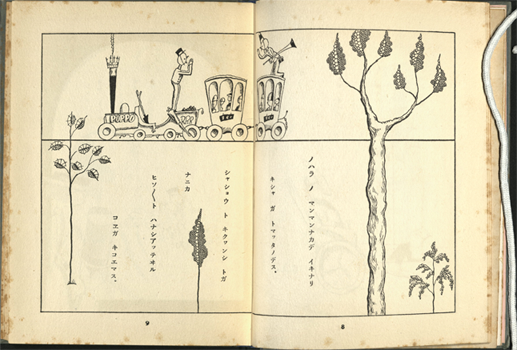 Takeo plays with magnification and perspective from page spread to page spread, like Carroll, on one page the boy is smaller than these other elements and on the next page they are the size of small toys compared to him, strengthening the readers' sense of the child's imaginary journey. His artistic influences show in his clean lines dividing pages between nothingness and busi-ness. His signature letters RRR appear on many pages as well as the clover, the symbol of the famous bookstore/publisher Maruzen. He attended Tokyo Art School in 1919 and admired artist Takehisa Yumeji and poet Kitahara Hakushu. Takeo is said to be influenced by Paul Klee, Gaugin, Van Gogh, and Cezanne. Takeo attended Tokyo Art School in 1919. He admired artist Takehisa Yumeji and poet Kitahara Hakushu. 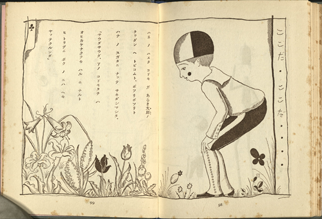 Like western children’s illustrators, Takeo published in children’s magazines of his day including Kodomo no tomo (Child’s Friend) magazine, in Kodomo no kuni (Children’s Land) in 1922, and in Kodomo Puck Manga magazine. Many Takeo magazine illustrations are at http://50watts.com/filter/takeo-takei/Takei-No-Kuni).